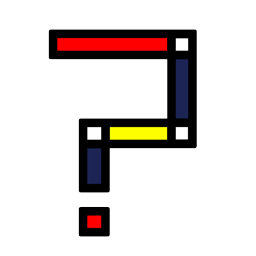 Inspired by the neoplasticism of the early 20th century, this app allows you to generate De Stijl inspired artworks in 'the style' made famous by artists like Piet Mondrian, Theo van Doesburg, Vilmos Huszár and Bart van Der Leck and colour them for yourself. Choose whether to adhere to the principle tenets of the movement, using only primary colours and non-colours, or create your own vision using the abstract frameworks generated in the app to give form in the formless. The app includes several free colouring pages and the art generator can create many more. All the images for colouring are printable if you prefer to draw by hand. The "plastic vision" of De Stijl artists, also called Neo-Plasticism, saw itself as reaching beyond the changing appearance of natural things to bring an audience into intimate contact with an immutable core of reality, a reality that was not so much a visible fact as an underlying spiritual vision. De Stijl was influenced by Cubist painting as well as by the mysticism and the ideas about "ideal" geometric forms (such as the "perfect straight line") in the neoplatonic philosophy of mathematician M. H. J. Schoenmaekers. The works of De Stijl would influence the Bauhaus style and the international style of architecture as well as clothing and interior design.